We were driving along one of the long dirt roads leading to far off villages of Yunnan and neighboring Sichuan when I had a strong instinct to stop the car. 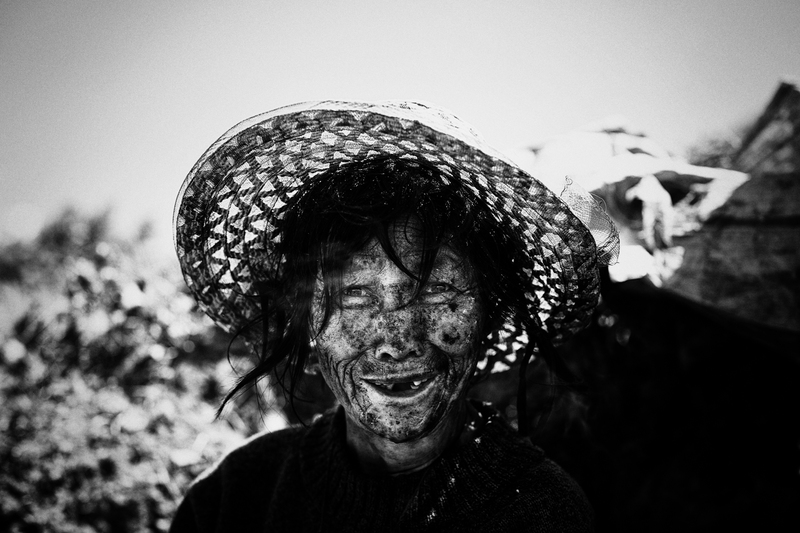 And as instincts are mostly right if we choose to listen to them, down a slope on the side of the road this most incredible woman was sitting under a broken umbrella and an old straw hat trying to hide from the blazing sun of the Yunnan mountains. 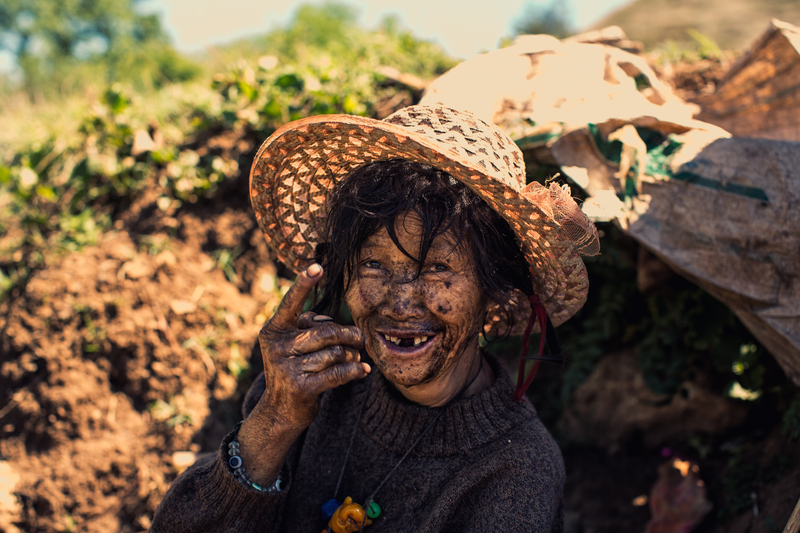 She spoke no words, only gestured with her hands and smiled her glowing toothless smile through a muddy face and tangled hair framing her warm face. In the end of her consenting gladly fo my friend and I photographing her, she asked with hand signals for water that she accepted from us with so much gratitude. She was adorned with strange jewelry and wore muddy rags, but she had the power to leave such a strong impression on us, that I most certainly found myself filing her memory in the ‘unforgettable’ category. Wow. Yes, remarkable. So much dignity. I bet that face could tell a few stories! Those are incredibly sharp full size! Excellent work !! Well done !! Incredible photo. What was she farming? Is alcoholism a problem in rural areas? Do people in rural areas have access to basic health services? She did not look at all like an alcoholic! Just unkempt and a bit lost. She was not farming anything, just sitting by the side of the road. The areas we were in are very remote and services are not comparable to what we see in the west at all. It is difficult to explain until you see it. Thanks for your comment. Great portraits Mimo. Definitely unforgettable. Both are fantastic but I really love the B&W.